That looks really delicious and moreish. The chef is new to me and I will be checking out about his show. This is a perfect one pot meal that we would love here. Thanks for the info and recipe! This recipe is so nice.and like all his recipes and easy to make one . Looks delicious! I enjoy watching River Cottage too! 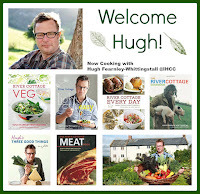 I would dream of working for Hugh Fearnley-Whittingstall and enjoy all those fresh produce hee..hee... This baked chicken with tomatoes and rice looks very delicious! I feel your pain when it comes to opening wine bottles! Why is it so hard? I also agree with you on adding more rice. My family would probably stare at me for more if I tried to serve them only a half cup or rice. Looks delicious as always. I like one pot dishes, except that timing issues can be tricky with each ingredient. You solve that by cooking the rice and chicken separately. The dish looks good. That looks like a perfect family dinner and bonus that it's a one-pot meal. I've never seen any of his shows - I don't think they're televised here - but it sounds like I would enjoy them. And this recipe is not in any one of his books I owned? Bookmarked!